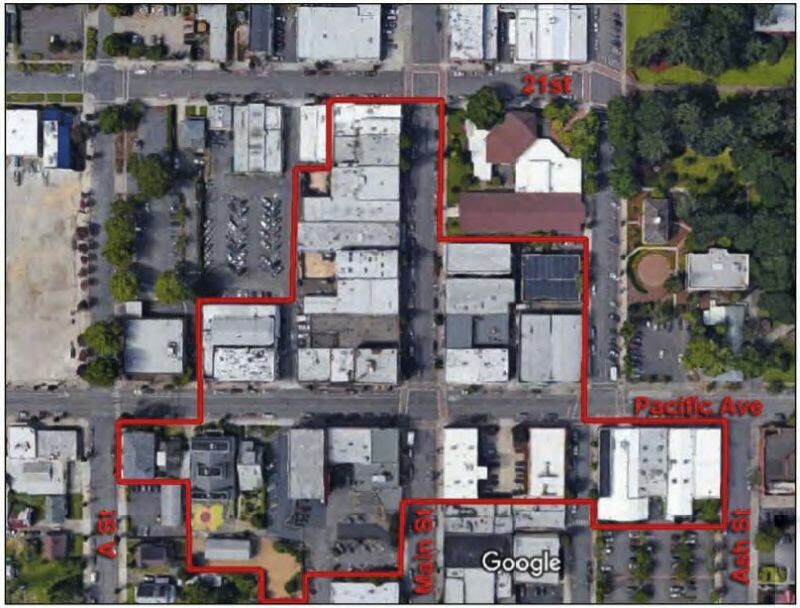 Downtown could join three neighborhoods as nationally recognized historic districts in Forest Grove. As one of the earliest settlements in the Tualatin Valley by pioneers who arrived on the Oregon Trail, Forest Grove is proud of its history. City officials are now hoping to have Forest Grove's downtown recognized in the National Register of Historic Places. The Forest Grove City Council gave the go-ahead to start preparing an application for a downtown historic district at a meeting Monday, Jan. 14. Receiving the historic district designation from the National Register, which is maintained by the U.S. National Park Service, wouldn't mean many big changes for downtown business- and property-owners, according to city planner James Reitz. He described the designation as "honorary." "It's a recognition, an acknowledgement that there's history or architecture or both in a particular geographic area that is significant in some way," Reitz said. He added, "Certainly, the history is there." Modern Forest Grove was built on land traditionally inhabited by the Atfalati, a band of the Kalapuya tribe. The Kalapuya were among several Native groups that were forcibly relocated to the Grand Ronde reservation, about 50 miles southwest of Forest Grove, after American settlers began arriving in what was then called the Oregon Territory. In 1872, Forest Grove became the first incorporated city in Washington County. "The downtown is part of the Original Town which was recorded in 1872," City Manager Jesse VanderZanden noted in a memorandum sent to the City Council before Monday's meeting. The proposed district would cover the buildings facing Pacific Avenue in between Ash and A streets and the buildings facing Main Street between Pacific and 21st avenues, with the exceptions of the Wells Fargo bank building and the Forest Grove United Church of Christ, which were built after the rest of the historic downtown and are not of the same architectural style. At the City Council's request, city staff will also include the buildings on the north side of 21st Avenue in between Main Street and College Way, including the American Legion Hall and the Fry Building, in the application. The nomination will have to be finalized and approved again by the City Council before it is submitted, Reitz said. Property-owners are often wary of historic district designations. But Reitz said that the designation itself would not impose any new design standards, and it would actually benefit property-owners by giving them access to federal tax credits and state grants for "building rehabilitation." "We know there are buildings downtown where the second floor, for instance, is either wholly unoccupied or underutilized," Reitz said, explaining, "You could potentially have apartments up there — but it costs money to do that. And it costs money to do that because maybe in addition to the usual building code issues, to rehab a building built in 1920 and bringing it up to 2020 building code standards, maybe you've also got to deal with seismic upgrades, and maybe you've also got to put in an elevator." Tax incentives could help allay the cost of some of those "high-ticket" building upgrades, Reitz said. The U.S. Department of the Interior notes the upside of these tax credits on its website. "The Federal Historic Preservation Tax Incentives program encourages private sector investment in the rehabilitation and re-use of historic buildings," the department states on its Technical Preservation Services site. "It creates jobs and is one of the nation's most successful and cost-effective community revitalization programs." Forest Grove already has three residential historic districts: Clark, Painter's Woods and Walker Naylor. In those cases, Reitz said, the city imposed restrictions on how buildings can be remodeled to ensure they retain their historic character. No decisions have been made about whether, or how, to do so if the downtown historic district is created. Whatever happens, the process will not be instantaneous. "It will go into 2020," Reitz said frankly. The City Council's vote Monday was to approve a grant application to the Oregon State Historic Preservation Office to cover the cost of nominating the downtown area for historic designation. Owners of property within the proposed district will be able to vote on whether to support the historic district nomination, according to VanderZanden's memo to the City Council. Those who wish to vote "no" must send their notarized remonstrance to the State Historic Preservation Office. If more than half of the property-owners do so, the application will automatically be rejected. "Forest Grove has had a highly successful nomination process to date: only one remonstrance was received during the nomination processes for all three of the city's current districts," VanderZanden noted in the memo. Reitz views the opportunity for those within the proposed district very positively. "The potential upside is the district is formed, the building-owners take advantage of that tax credit program and rehab those buildings, so maybe we get some more housing out of it. That's a plus," Reitz said. "We certainly get buildings that are worth more money, so that could translate into greater tax revenue, although I'm sure the amount is not significant. And you get a downtown that is more robust, because now you've got buildings that are occupied, and you've got people downtown who are patronizing the local businesses." He concluded, "I don't see a downside, personally."